Introducing the 3D Anatomy Academy from Yamuna. Your body is your anatomy textbook. Anatomy U puts the knowledge at your fingertips, literally. This unique and interactive body intelligence curriculum will put you in touch with your own anatomy. Yamuna’s innovative approach guides you to awaken your body’s true potential. 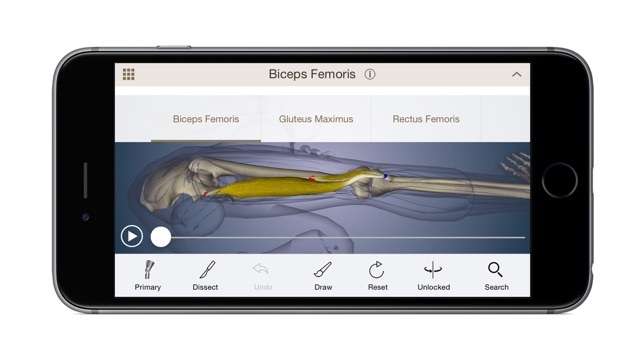 AnatomyU transforms you into an expert on your own anatomy. All you need to access your body’s true wisdom is your body, the Yamuna black ball, and a desire to learn. •	It is both a learning and teaching tool to understanding the muscles of your body and how they work. You choose the module of muscles you wish to explore and begin. •	Virtual 3D interactive human anatomy with fluid scrolling, zooming, and panning. •	Add or remove layers of muscles to reveal origins and insertions to understand relationships of muscles. •	Detailed descriptive copy with stunning visuals within every exercise. •	Allows for screenshots to be taken and shared for instructional purposes. Note: The Yamuna® black ball is required and serves as a cursor and guide to your self anatomy exploration. Yamuna Zake is a master teacher and healer who has dedicated her life to understanding how the body works and helping others to create positive change in their bodies through what she has learned. Today, Yamuna is a world-renowned authority whose simple, yet profound methods have been proven beyond doubt. Yamuna is as exceptional as she is real; as intelligent as she is accessible; as generous as she is devoted. Her thinking and her methods are uniquely her own. She lives her vision that a fully aligned body with all of its capacity for movement free and available is the most beautiful body possible. A better way to understand health and the human body, the BioDigital Human is the first 3d human body platform for the visualization of anatomy and disease. Users can choose from 1000's of interactive visualizations to build their own custom libraries of models at www.biodigital.com. This knockout piece of software, sophisticated yet easy to use, rewards me over and over. The illustrations alone offer depth like no other anatomy software I’ve ever used. I can change the angle, view the animations over and over, rotate and zoom, and check the info against what I’m watching. Not just insertions etc, but also the “experiential anatomy” descriptions are outstanding. It’s like having the most informative, least judgmental anatomy class ever. And it’s mastery learning; I go at my own pace, module after module. Magnificent. It took me months to decide to spend the money. Wish I’d done it sooner. 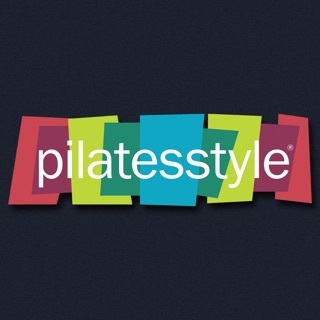 As a devoted Pilates student, I have found this app to be extremely helpful. I particularly appreciate that it may be purchased in sections by parts of the body. The resolution of the multi dimensional photographs are of the highest quality, which gives us the ability to see the position of the muscle from a number of angles. This is an app that can benefit anyone and everyone, regardless of their age, the type of exercise they practice, or their level of knowledge. 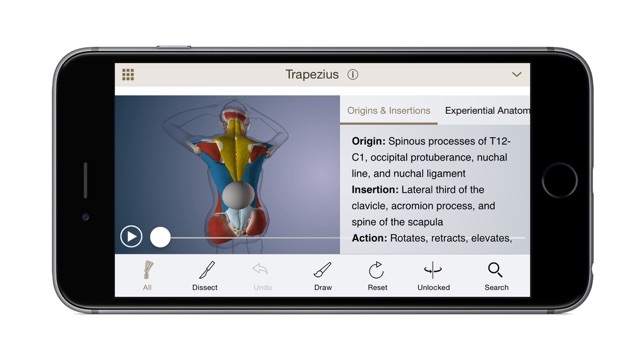 Having used several anatomy apps consistently with my clients, I am excited to offer the information available in AnatomyU. The most unique thing about it is that clients can see the body in motion as they work on themselves. I am unaware of any other program that explores body knowledge in this way. 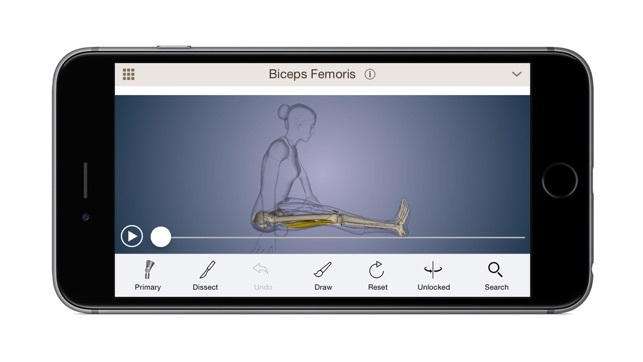 The app is intuitive and allows users to explore to the depth of bone, which is where structural healing occurs. The body is worked in its natural logic and order, generally from larger to smaller muscle groups. Of course it follows the healing principles of the remarkable healing modality, Yamuna Body Sustainability (Yamuna Body Rolling). As a teacher I am able to take screen shots of parts of the body, make notes on them and then share with my clients. It's an ideal tool not only for body workers like me but for anyone interested in learning to heal their own body. © 2019 Yz Studio Inc.